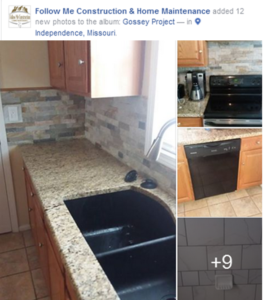 This Gossey Project is a perfect example of our vision at Follow Me Construction and Home Maintenance. Our goal as a company is to provide any homeowner the opportunity to have the best-looking house on the block for a reasonable price. When the Gossey’s called, we worked with them to create a kitchen they could really show off. We also take special care to cater to each of our customers individualized needs. The Gossey Project required a custom doggy door for the families adored pet, Sophia. Now that we have financing options, this vision has become even more accessible for homeowners with dreams of renovation. Thank you Rachel Gossey and Eric Gossey for hiring Follow Me Construction and Home Maintenance!